Ahmad Rahami lawsuit: Did perceptions of being persecuted because of his Muslim faith lead to one Elizabeth, NJ man seeking retribution? 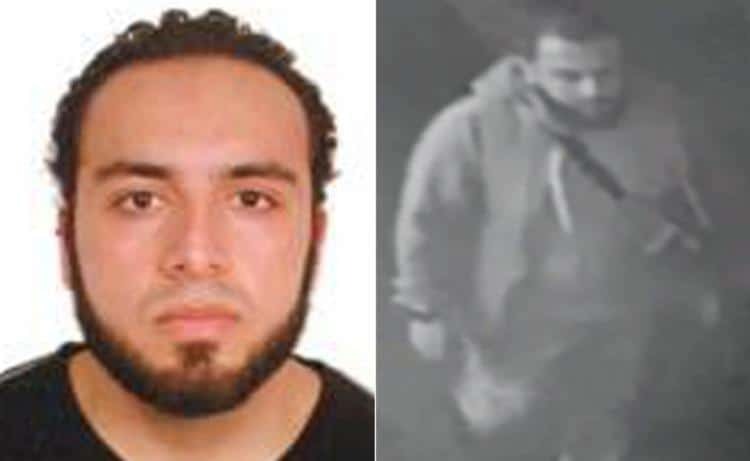 Ahmad Rahami the prime suspect in the NY and NJ bombings, since arrested, Monday morning, had previously sued the local police force claiming that they were persecuting him for being a Muslim. The exclusive via the dailymail tells of Ahmad Khan Rahami, 28, launching a lawsuit against Elizabeth, New Jersey Police department with the man claiming that he and his family were subjected to discrimination and ‘selective enforcement’ based on their religion. 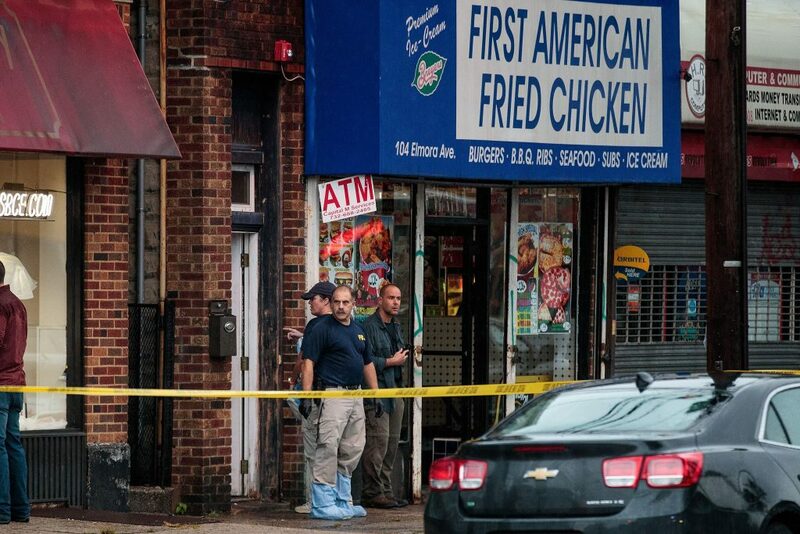 In the family’s complaint, Ahmad Rahami claimed that local police had tried shutting down their chicken restaurant, ‘First American’, (yes the irony…) too early each night with ‘baseless’ tickets and summonses. Ahmad, 28, his father Mohammad Sr, 53, and his brother Mohammad, brought the lawsuit together, also claiming that local residents also racially abused them, alleging they were told, ‘Muslims don’t belong here’. The lawsuit, filed in 2011, describes the son having a long history of grievances with city officials, their local police force and people who lived close to them. Five years later Ahmad has been held over his alleged involvement in the New York and New Jersey bombings. Why did Ahmad Khan Rahami plan Chelsea explosion? The lawsuit, filed in the federal court in Newark, says that the family are from Afghanistan and are all Muslims who have owned the chicken restaurant since 2002. From April 2009 for two years they allege that they were unfairly targeted for staying open past 10pm despite being permitted to do so. 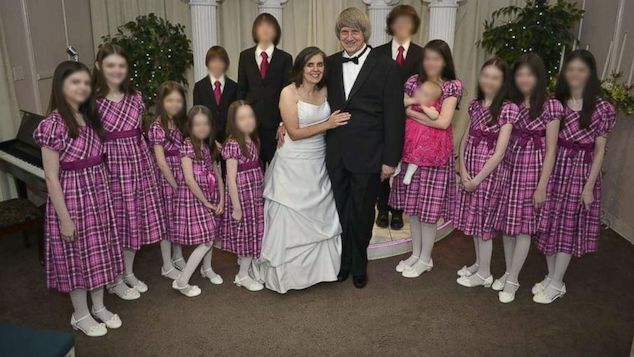 In the lawsuit, the family claimed police had a ‘reckless disregard and deliberate indifference for plaintiff’s constitutional rights of liberty, due process and equal protection’. The Elizabeth police department allegedly ’embarked on a course to harass, humiliate, retaliate against and force their business to close at 10pm’. The lawsuit claims that the officers told them there was ‘too much crime around here’ and that the area around the restaurant was ‘known for criminal activity’. Ahmad Rahami lawsuit obtained via the dailymail. The Rahamis according to the dailymail in their lawsuit, alleged being subject to ‘selective enforcement’ that were ‘solely based on an animus against plaintiff’s religion, creed, race and national origin’. As a result of the police shutting them down at 10pm, despite other businesses being allowed to stay open at that time, the family claims suffering economic hardship. The court documents confirm that Ahmad Rahami being arrested for obstruction of justice, disorderly conduct and resisting arrest, although they do not specify when or what the outcomes were. 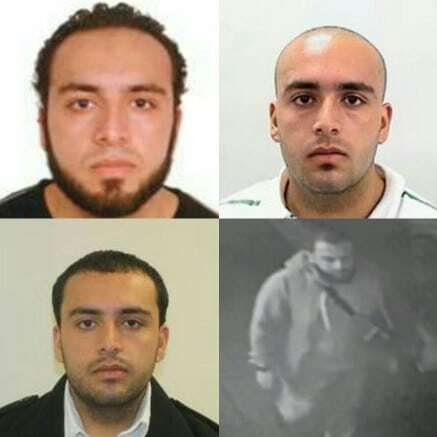 Previous police booking photos plus Ahmad Rahami caught on surveillance camera near the place of both bombs in NYC’s Chelsea district. 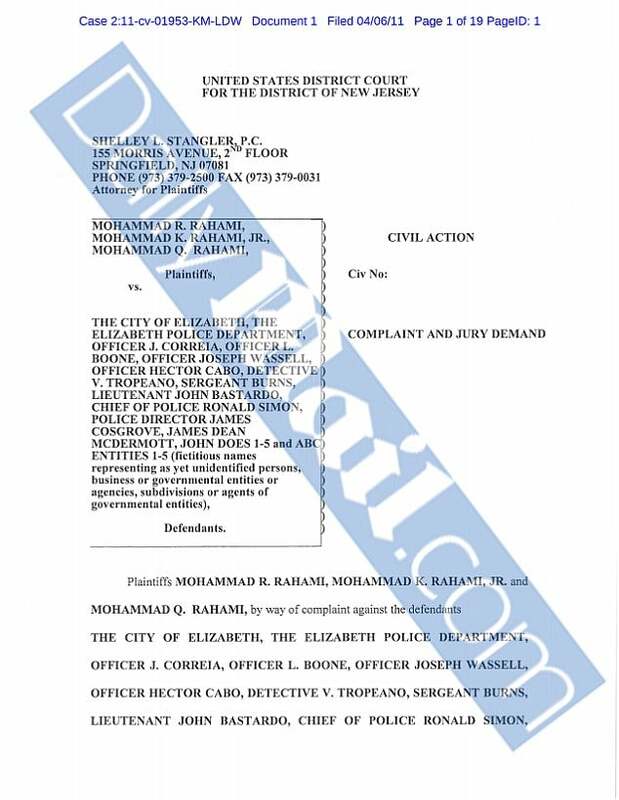 One instance of cited discrimination brought up in the suit, cited local man, James McDermott, the owner of Dean Relay Press and Radio, a photo agency that is near to the Rahami’s chicken restaurant. McDermott is alleged to have told them that ‘Muslims should not have businesses here’, ‘Muslims are trouble’ and ‘Muslims don’t belong here’. Claims McDermott categorically rejects. The 11 count lawsuit names the City of Elizabeth, the Elizabeth Police Department, six Elizabeth police officers, chief of police Ronald Simon and police director James Cosgrove. Court records show that the Rahami complaint being dismissed with prejudice in 2012, meaning that it could not be brought again. 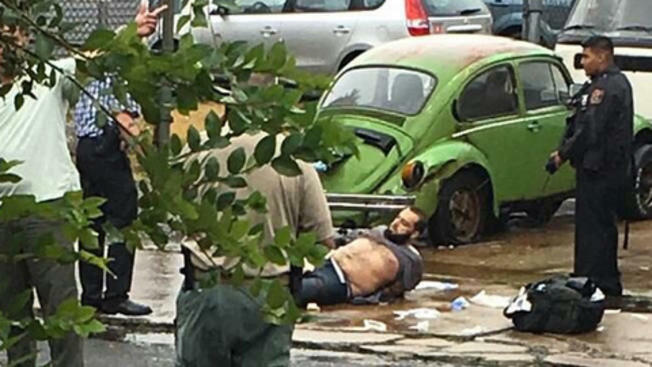 Ahmad Rahami during his arrest Monday morning, with authorities now saying the suspect acted as a lone man. Countering suggestions of being set upon as a result of the family religion, a report via the nydailynews quoted regulars at the restaurant saying Ahmad Rahami was a chilling presence behind the counter. Nevertheless a report via the nytimes found one patron, Ryan McCann who held Rahami in good stead. Few details about Rahami’s life up to the man’s arrest. 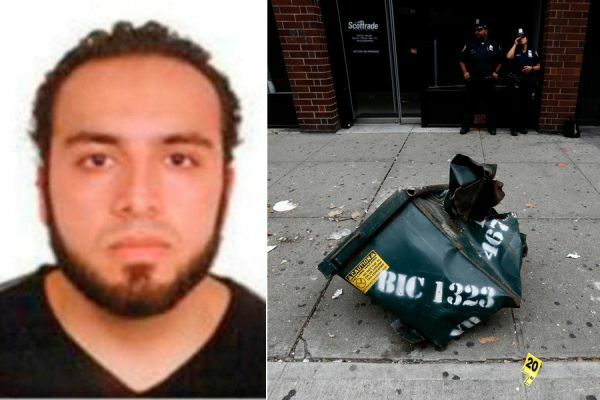 His family has been unavailable for comment, as pundits on the web wonder to what degree Ahmad Rahami’s grievances with police and what he perceived to be persecution against him for being Muslim may have led to the man targeting bombs over the weekend …?